Home » Gear & Weapons » Using a Flamethrower on Zombies, a Horrible Idea! Using a Flamethrower on Zombies, a Horrible Idea! Catching Zombies a flame might sound like a great idea but in reality this could be the worst idea ever. The problem with the this process is that zombies after a few day are dehydrated and lack any type of hydration which means that the skin they wear will catch fire more easily. Again you are asking what is the big deal then? Well as you already know you must destroy the fleshy brain parts to bring down a zombie, but when you catch them on fire all you have now is a walking undead zombies that is on fire, that will have a greatly increased percentage of catching other zombies and other things on fire. Now you have a flaming mess, and god forbid you catch a zombie on fire in the woods during a dry heat, you might as well run, run, and run some more because now you have flaming zombies chasing you as well as the forest fire. Think of a zombie as a walking wicker stick, road flare, and or candle. If you are going to use fire to destroy a zombie there are a few things you can do. One is use a controlled environment meaning a secluded building or cave that can be sealed up, so that all you will need to do is lead the zombie in and light the building on fire with the zombies in it. 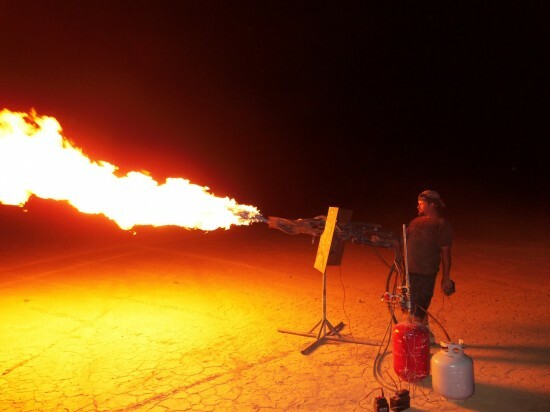 A flamethrower usually has a very short range no matter how much you can press the flammable stream out. Not only will you have limited range you will also need to account for wind, a huge gust of wind can press your stream in all types of directions if you are not careful. If a horde of Zombies are coming at you then the flame thrower is almost useless because it may take a zombie a good 10 steps towards you before it actually goes down from being consumed by the fire. The only way we think a flame thrower can be of any use is if you can lure zombies into a large pit area where they are stationary and unable to get out while you pour the flaming streams upon them from high ground. The other use is for discarding dead Zombies. Anytime you use fire such as a flame thrower, Molotov cocktail, or any type of highly combustible substances you will need to make a good educated guess on what the repercussions may be before you go “Burn! Baby! Burn! !”, on them.